It’s that time again – time to gather those eggs and think about how you want to decorate them for Easter. While the traditional way of dyeing in a vinegar based dye is always good, there are many other ways that you can make those eggs really stand out. 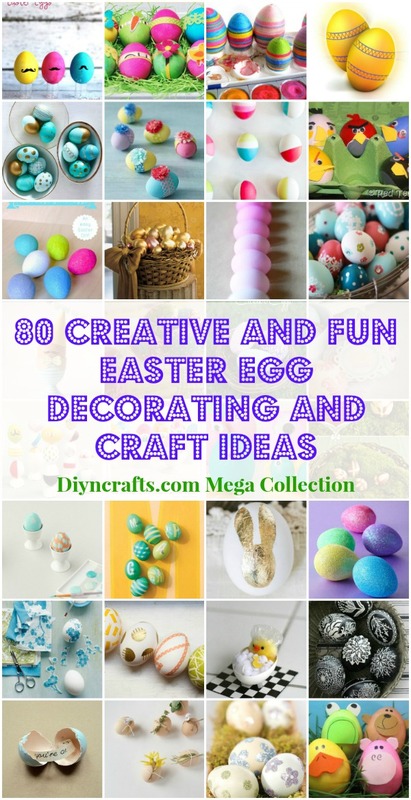 We have collected 80 different ways that you can decorate your eggs this Easter that are fun and creative. Kids will love them and you will adore the different ways of making your eggs a bit more unique than last year. Why not turn those plain Easter eggs into Easter Bunnies? This is a really simple project, and it doesn’t take a lot of craft supplies to make these little bunnies. Kids are going to love decorating their eggs into Easter bunnies for their egg hunts! A little glitter is never a bad thing. 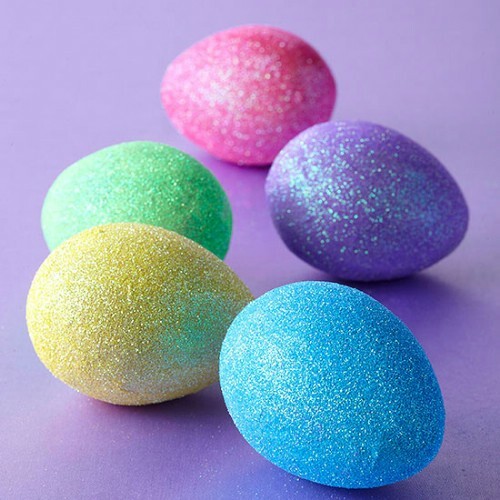 If you want to color your eggs and make them just a bit different, glitter is a great choice. 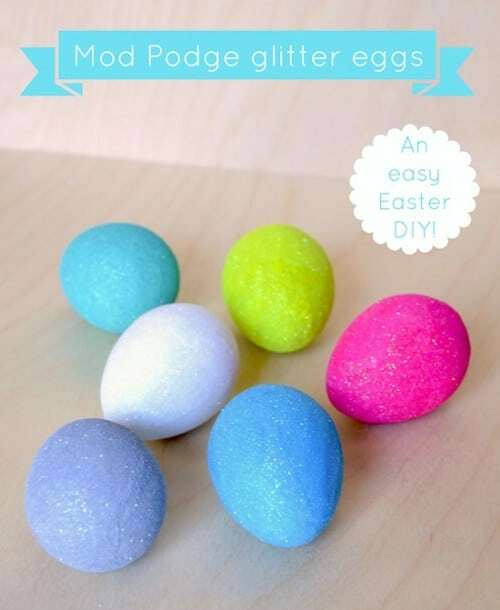 Making Easter eggs glittery is not difficult and is a project that kids can do. You just have to choose the colors that you want to dye your eggs and then select glitter that will mesh with those colors. 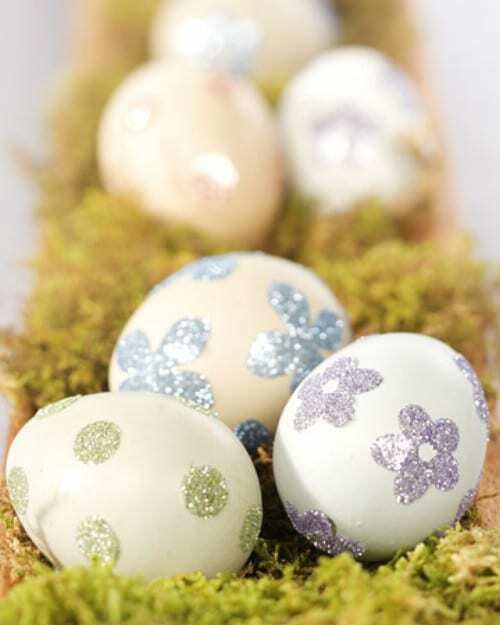 A little glue will hold the glitter in place and give you sparkly and beautiful eggs that any kids will adore. 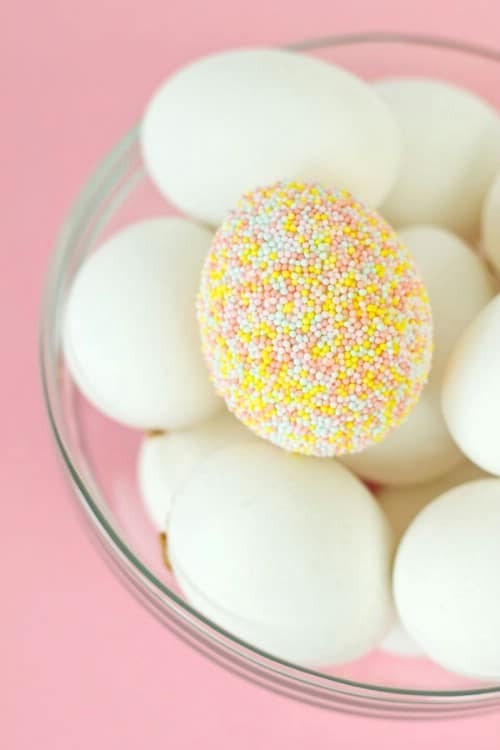 Kids love sprinkles and they will absolutely love these sprinkle eggs. With a few nonpareil sprinkles, you can create colorful and gorgeous eggs that are sure to catch everyone’s attention at your egg hunt. Note that you do have to use glue on these to get the sprinkles to stick so it is important that you make sure no one eats the sprinkles afterwards. You can use any type or color of sprinkles that you want to create beautiful eggs that are as unique as they are fun. Is there anything cooler than these fluorescent eggs? They look a bit like alien eggs to me, so you know the kids are just going to love them. For this technique, all you need is the paint, warm water and vinegar so that it turns into a dip-able dye. Easter egg hunting will take on a whole new approach if it’s done in the dark this year! You don’t have to stick with the traditional way of dyeing your eggs. You can paint them instead if you like. Acrylic paints work very well for making unique Easter eggs and you can paint anything that you want on them. Match pastel colors for a really spring-like look or create your own little picture scene if you want. 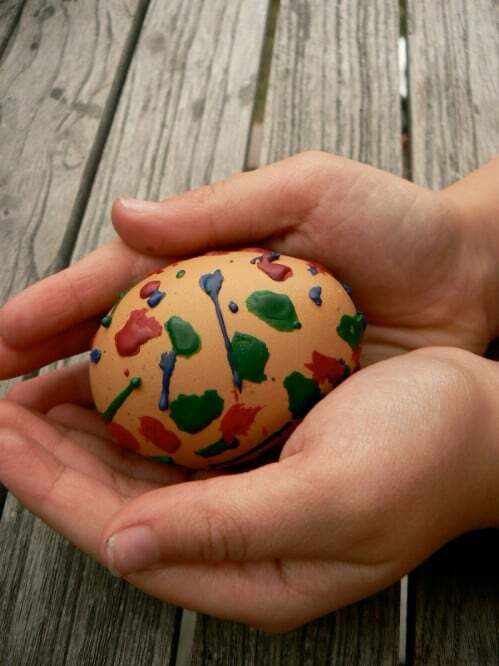 This is a great way for older children to enjoy coloring those eggs this year. 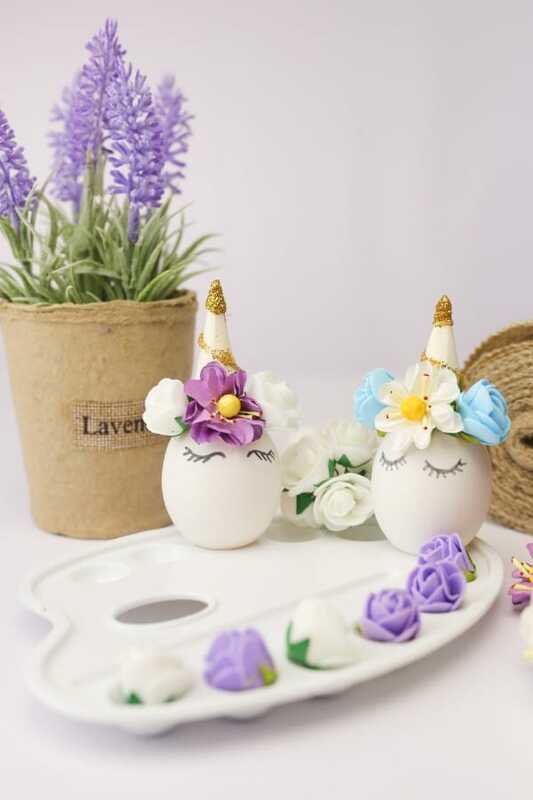 If you prefer not to hard boil your eggs but want a creative outlet for them instead, there are many different crafts that you can do with eggshells. 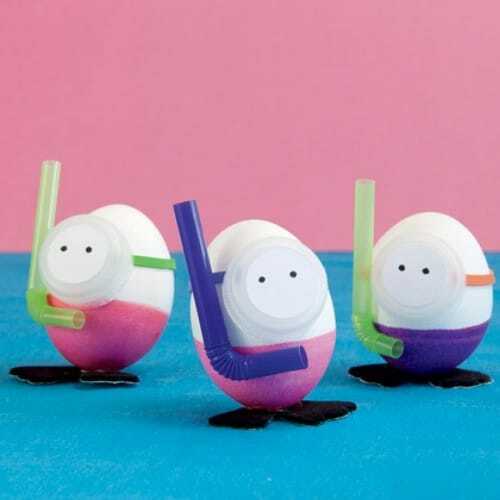 From carving out a boat to making an umbrella for a little friend, these little egg crafts are sure to get some attention and will look adorable on your Easter dinner table or sitting around the house just anywhere. Instead of dyeing the entire egg, why not just glue pictures of gold onto it? Kids will love making these eggs that are as beautiful to look at as they are fun to hunt for. You just have to choose the images that you want to glue on and then trace them from a template and cut. 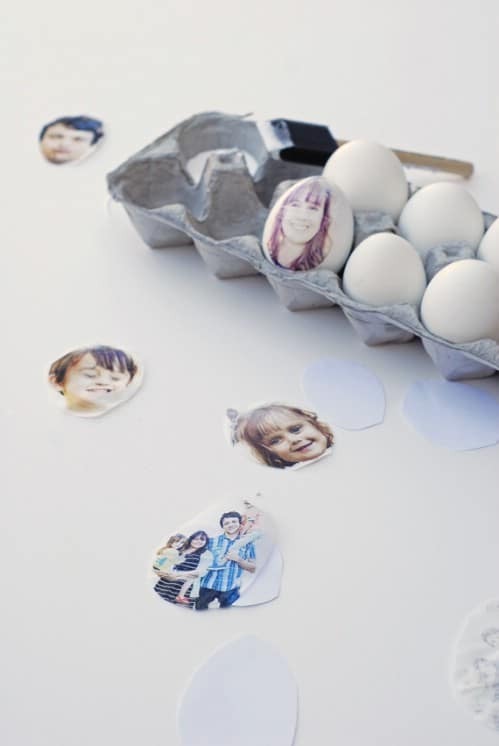 These will work with plain white eggs or you can dye the eggs and then use the images – whatever you want. 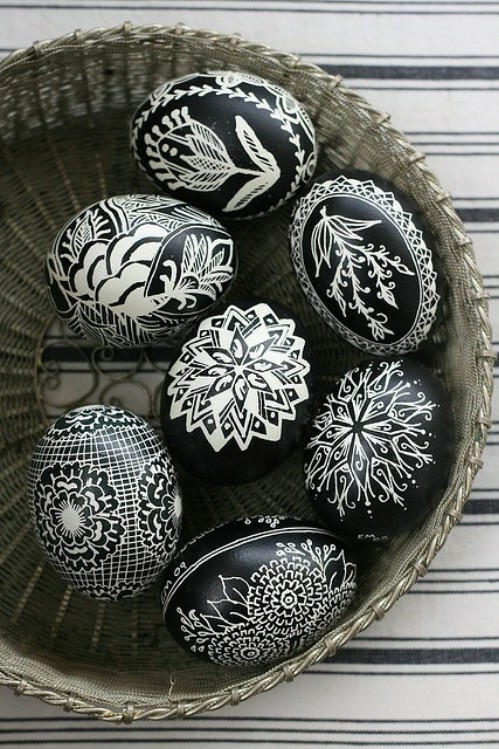 Black dye and white paint put together make beautiful and very elegant Easter eggs. If you have an inclination to do something really different, why not make all of your eggs black and white? You can stencil in different pictures or designs with white paint and the overall look is absolutely gorgeous. These would be great for an adult themed Easter egg hunt. You actually don’t have to dye your eggs at all. 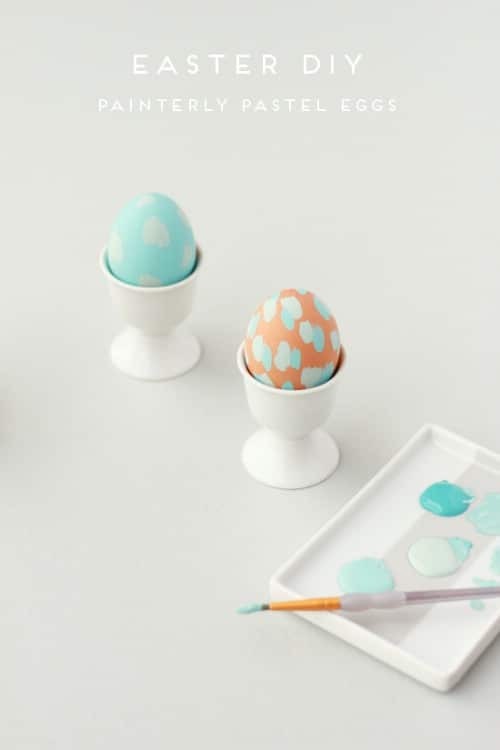 You can just use Washi tape instead and this is a great way for younger children to help color those eggs without all the mess that comes along with dyes. You will need to select different colors and designs of Washi tape, which you should be able to find at your favorite department or home improvement store. Then just go to town decorating those eggs however you want. 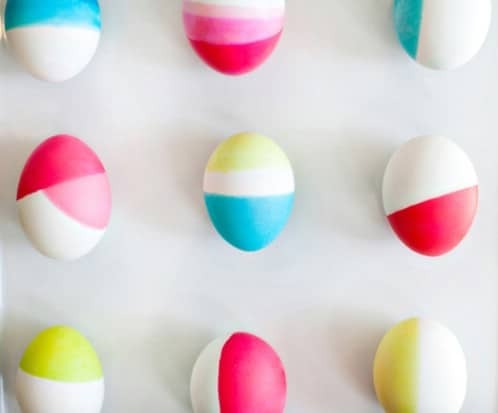 If you want to use your dyed Easter eggs for decorating but you don’t want just plain dyed eggs sitting around, think Ombre. This gradual change in color hue is beautiful and will look great when displayed on a table or mantel. 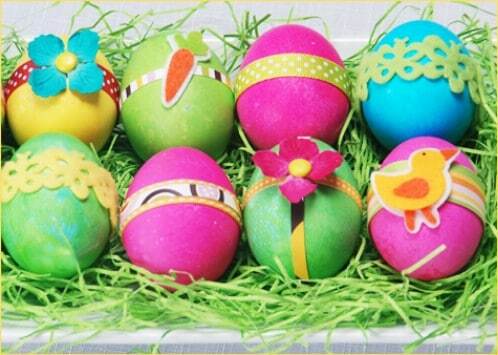 You will need to choose the color for your design and then just dye the eggs a bit darker as you go along. The gradual color looks great and you can mix and match your colors if you want. You can find inspiration and craft supplies in some of the strangest places. For Easter eggs that are elegant and beautiful and that really stand out, think doily. Doily eggs are really easy to make and look like those doilies that you remember from your grandmother’s house. You can find paper doilies pretty cheap at the Dollar Store and you won’t need more than a pack or so to do a dozen eggs or more. 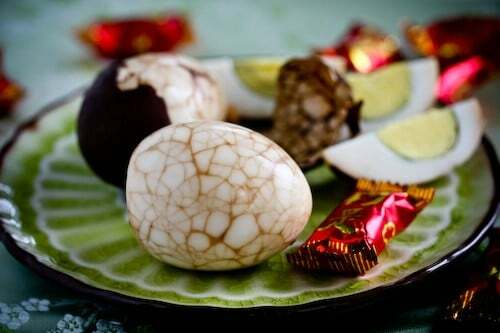 Marbled eggs are gorgeous, particularly when they are set in gold. 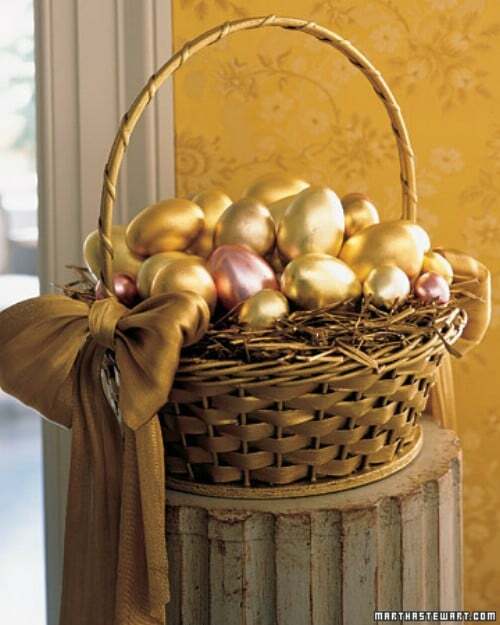 Imagine having golden eggs with marbles of bright or pastel colors at your Easter egg hunt. 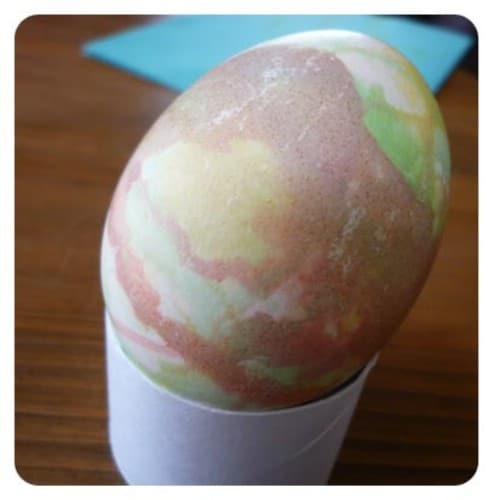 These marbled eggs are much easier to create than you may think and they are sure to be a huge hit with the kids. 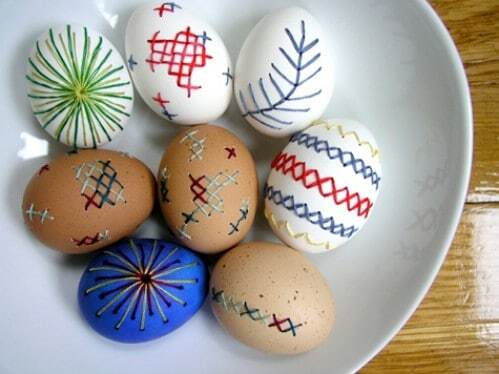 You can blow out the eggs if you want before you begin to make these for decorations and they will keep for quite some time after the holiday. 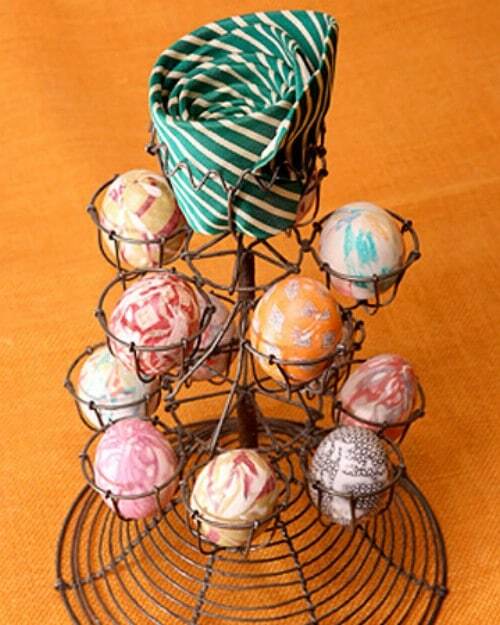 Why settle for plain dyed eggs when you can create whimsical designs? 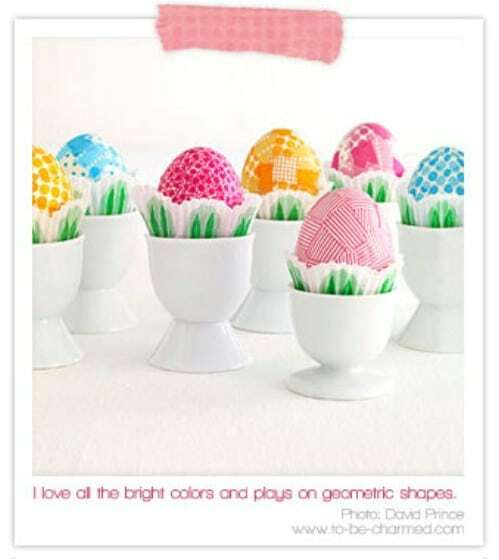 These graphical designed Easter eggs are really simple to create and this is a great project for kids of all ages. If your little ones love helping to dye those eggs, they will adore making these graphical eggs. You need tape that you will use to determine how the design flows and the rest is just traditional dyeing. For those really creative types, these subway art eggs are a must. You will still need to dye or color your eggs in some fashion and then simply paint the messages that you want in traditional subway art form. 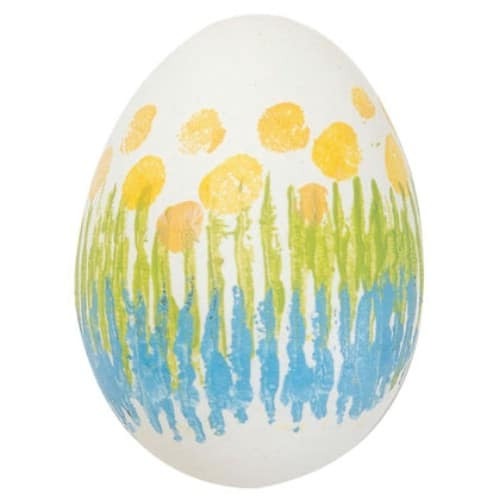 This is a great way to make those eggs unique and is a fun project for older children and/or teenagers who may think they are a bit too old for traditional dyes and stickers. 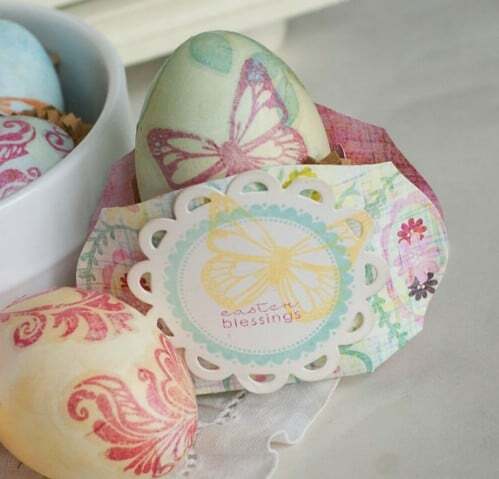 Pretty ribbons adorn these Easter eggs and make them really unique and special. Note that you may still want to dye the eggs in whatever fashion you choose and then you just attach the ribbons, which really look like a baby’s headband. 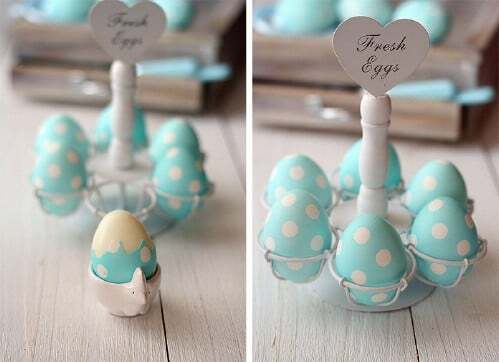 These are adorable and will make wonderful decorations so if you want to blow out the insides of the eggs beforehand, you can use these to dress up your table. 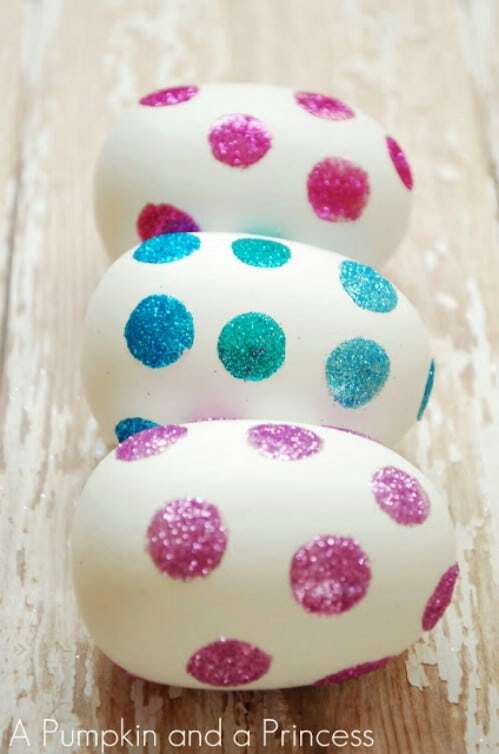 Little dots of glitter are sure to be a huge hit at your Easter egg hunt. These eggs can be dyed or left plain if you want. You just have to make little glittery polka dots on them in a pattern or you can go freehand. 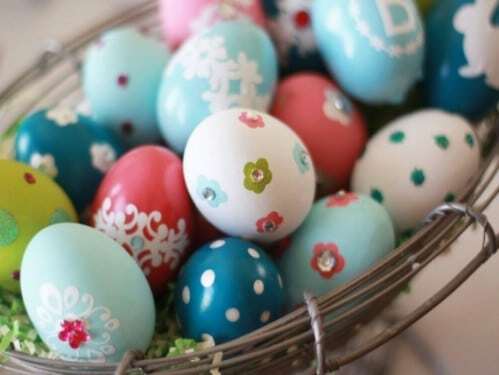 If you prefer just to do these for decorations, you can find wooden eggs at most craft stores that are ready to be decorated as well. 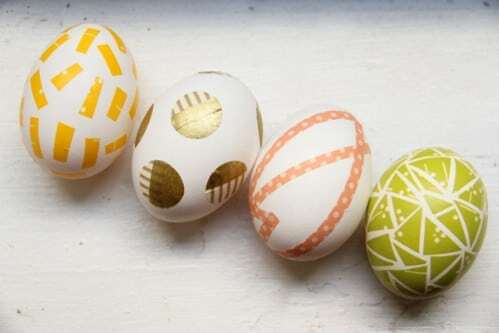 From traditional lace to more modern geometrical shapes, there are many ways that you can use Washi tape and other supplies to decorate your eggs this year. Japanese Washi tape is a fabric like tape that you can find in so many different colors, patterns and sizes. You can use this tape to create beautiful traditional designs on your eggs, with or without dyeing them. Why not make those eggs a bit unique by painting silhouettes on them? You can have eggs with bunnies, lambs, chicks or just whatever you want. You just need to choose the images that you want silhouetted before you begin dyeing your eggs and then the process is really simple. 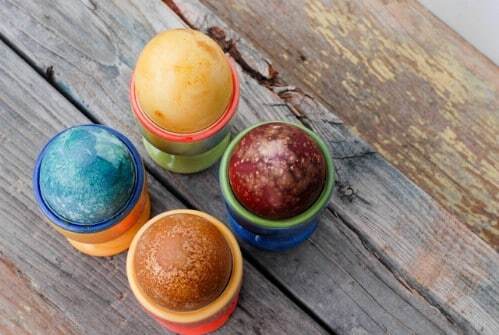 Kids of all ages are sure to want to try out this method for creating unique and beautiful Easter eggs. 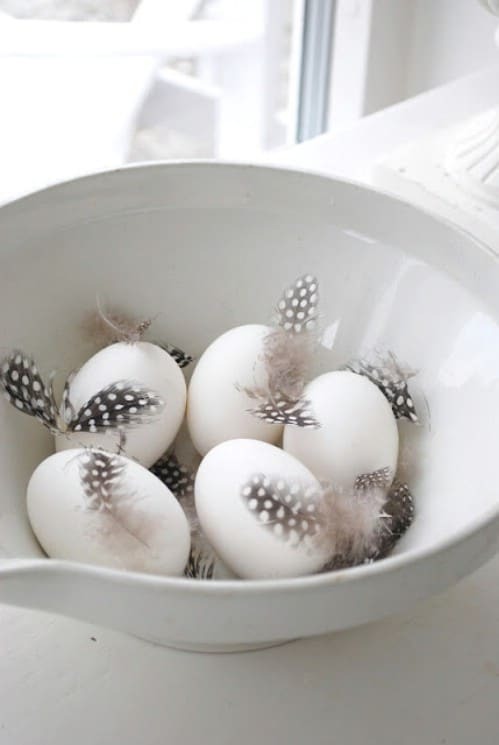 Whether you are looking for a decorating idea or you really want something different for that egg hunt, think feathers. You can buy feathers in a number of different sizes and they come in many different colors and designs. Use those feathers to give your eggs a little something different. You can dye them beforehand or simply use the feathers as your sole decorating method. 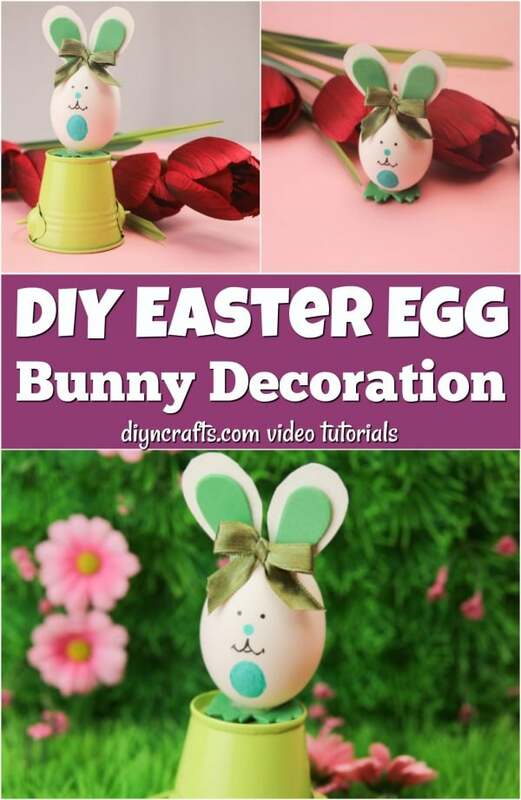 This craft actually works better with Styrofoam eggs but you could attempt it with the hard boiled variety as well. It simply consists of attaching fabric flowers to eggs. They turn out beautifully and would look wonderful adorning an Easter tree or you could use them for prize eggs for your egg hunt. The process is easy and you can be as creative as you like, making multi-colored eggs or sticking with one color for each egg. Why not allow the kids the let their imaginations run wild and create colorful and unique doodle eggs? 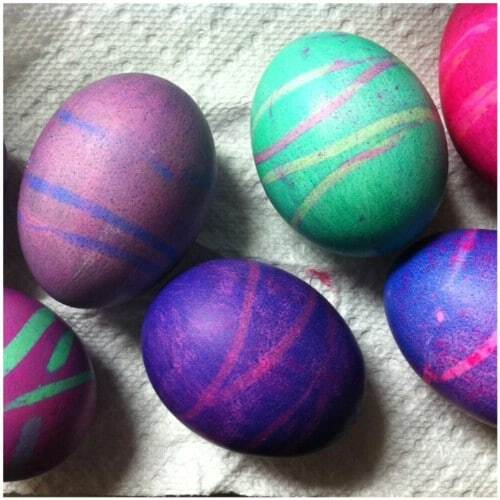 Depending on your preference, you can dye these beforehand or just go with plain eggs. 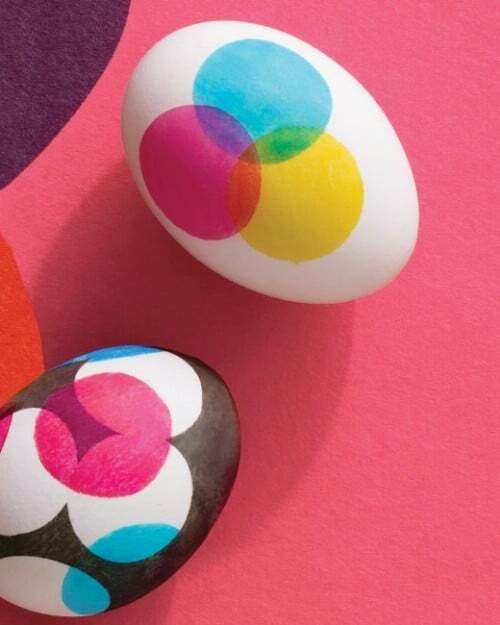 The gist is to simply doodle colors and designs all over the eggs so if you have little ones and you prefer not to use dye, this is a great alternative. 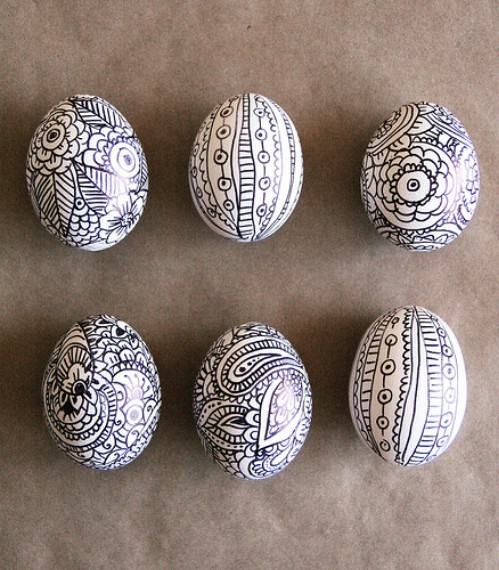 You can also blow out the eggs and doodle them for decorations or to hang on your Easter tree. Make those eggs really special by adding a little bling. 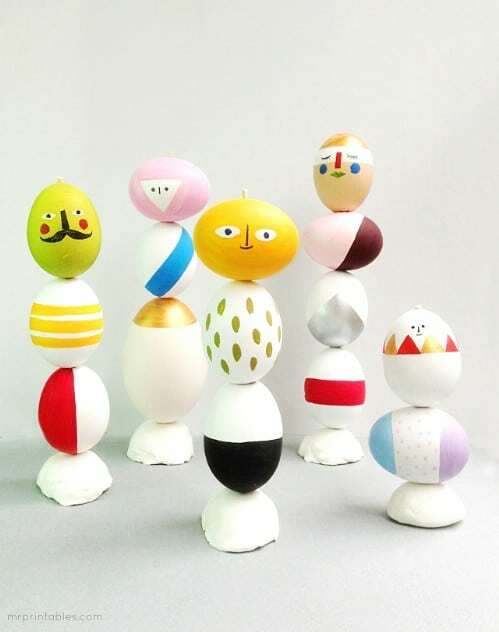 If you aren’t decorating eggs for an egg hunt but you just want a few sitting around for decoration, you can make these from wooden eggs that you can buy at most craft stores. You just choose the bling that you want and go to town making your eggs fabulous. These are great for centerpieces or to decorate that Easter tree or you could bling a few for your Easter egg hunt. If you want something a bit more elegant and sophisticated, these sienna eggs are perfect. They turn out gorgeous and the best part is that they are completely non-toxic and easy to create. If you are hosting an egg hunt for grown-ups or you just want something a bit different than the traditional pastel and bright colors, sienna eggs are the perfect alternative and you can get really creative with their design. For something really unique and fun, why not turn your hard boiled eggs into little divers? This project makes adorable Easter eggs that are as fun to look at as they are to hunt. You just have to dye the eggs in the appropriate pattern and then add a few embellishments to make them look like little snorkelers. The design gives them a “Despicable Me” minion look as well. Instead of traditional pastels, why not go unique with neon colors? 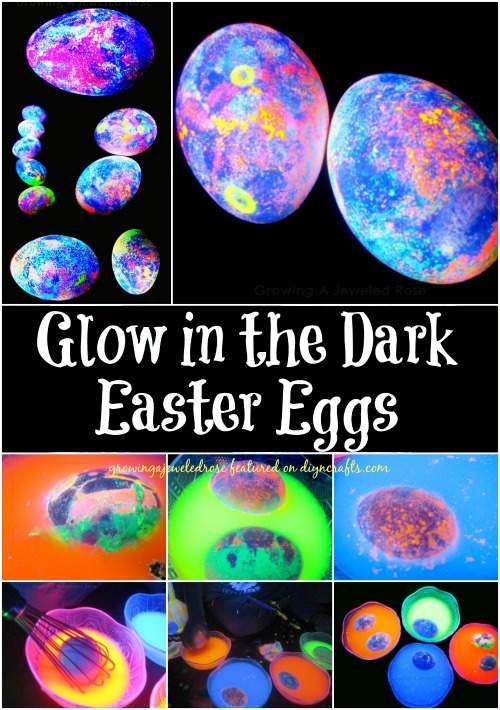 These neon eggs are fun and creative and will certainly stand out so they may be a bit easier to find on those egg hunts. You will need a few supplies like paper bags and cardboard to create the neon dyed look but the process is relatively easy and perfect for school aged children. 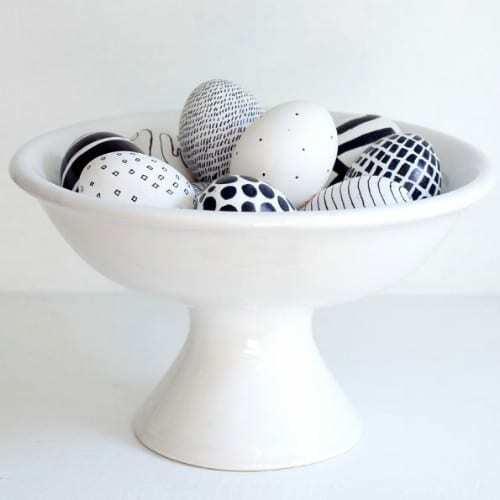 These black and white eggs are both elegant and really creative. If you prefer something a bit less colorful for your Easter eggs, black and white is certainly the way to go. The design is completely up to you so you can make them all match or have a modge-podge of different designs. This is a great modern look to the traditional Easter egg and one that is sure to get you quite a few compliments. For something really elegant, lace is always a good thing. 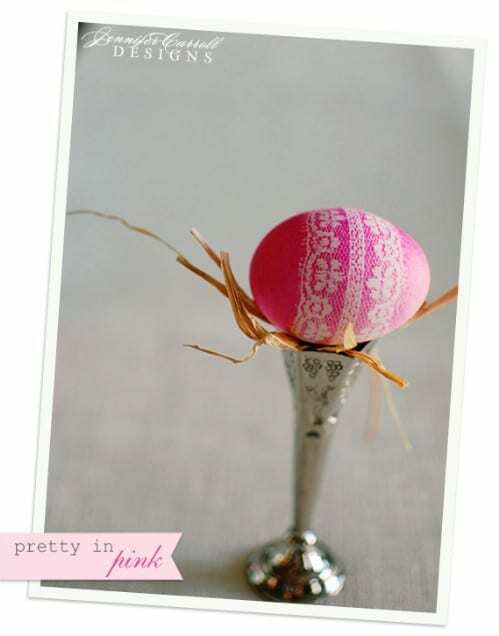 Lace covered Easter eggs are sure to be a hit and they are really easy to create. You will want to dye the eggs so that the lace shows up well and then it is just a matter of choosing the lace that you want to display on your eggs. Bright pastel colors work very well and will really show off the lace. Want something really modern and unique? 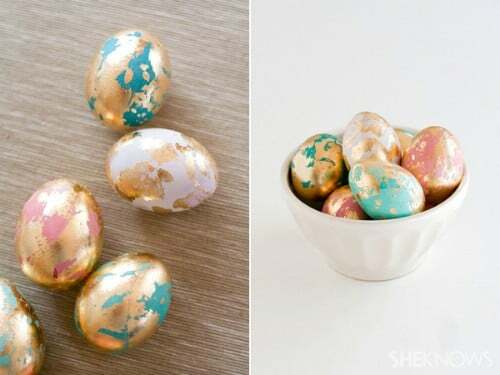 Try these metallic dipped Easter eggs. They are bright and colorful and are sure to be a hit at your egg hunt. Gold and silver give your eggs a really sophisticated look and you can draw any design that you want. Polka dots and stripes work really well or you can be really creative and go for a more complicated design. 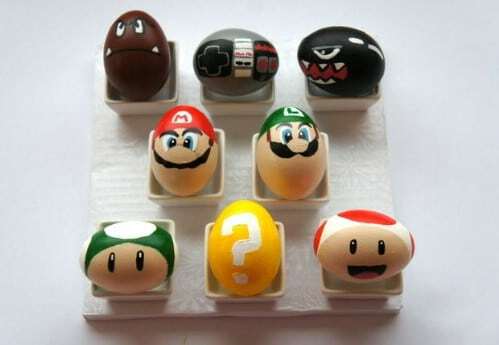 If your kids (or you) are fans of Super Mario Bros., you can create Easter eggs that show off your passion. Imagine adding Mario, Luigi and the rest of the gang to your Easter egg hunting fun. These eggs are colorful and very creative and are sure to be a huge hit with your egg hunting guests. Just choose your favorite characters from the Super Mario Bros. games or make an egg for every character if you want. Whatever color you choose to dye your eggs, they will look great with little polka dots on them. If you are planning an Easter breakfast or brunch, these decorated eggs will look perfect on the table. They can be done in any color and the white polka dots really make them stand out. 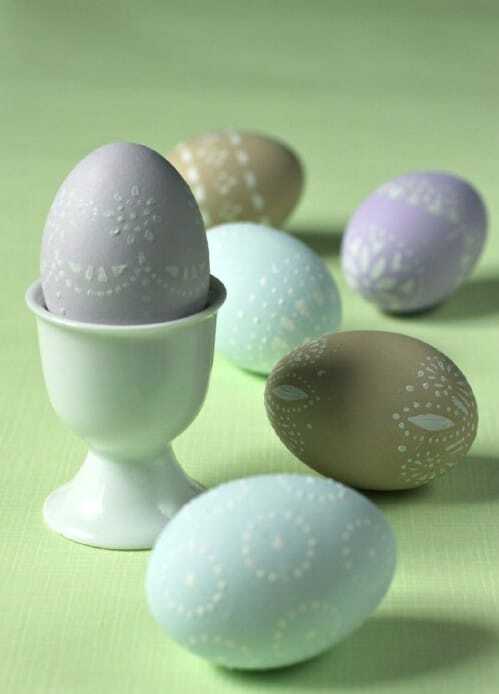 If you have polka dotted tableware, you can dye the eggs to match. They are sure to bring fun to the table. Decoupage is fun and gives you the chance to be really creative. With just a little imagination, you can create very unique and beautiful decoupage Easter eggs. This is a great project for older children as cutting will be needed. 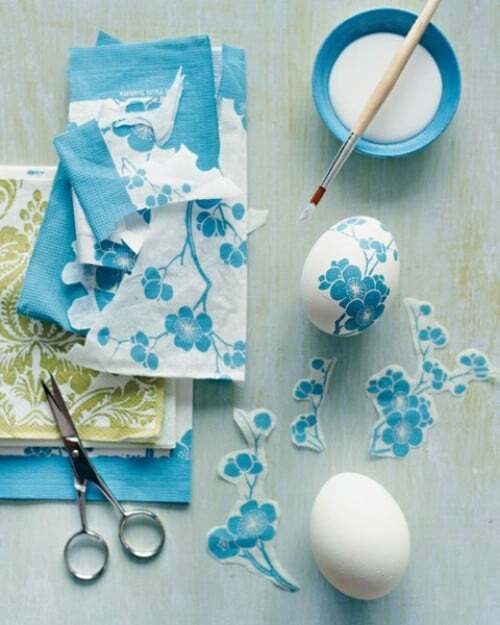 Choose your cuttings from fabric or even magazines if you want and then affix them to your eggs. There is no limit to the pictures that you can use for this project. These eggs are made by using craft thread and Styrofoam eggs, although you could probably use hard boiled eggs if you wanted. 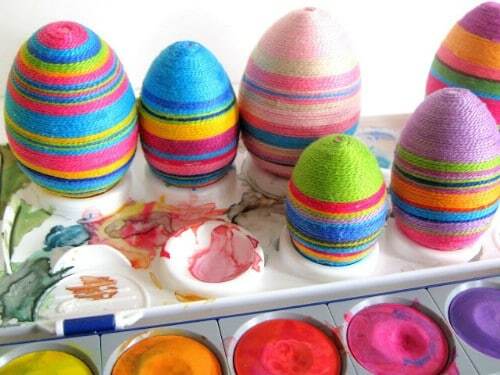 If you have craft thread sitting around, you can put it to good use by creating these very colorful and very beautiful eggs. 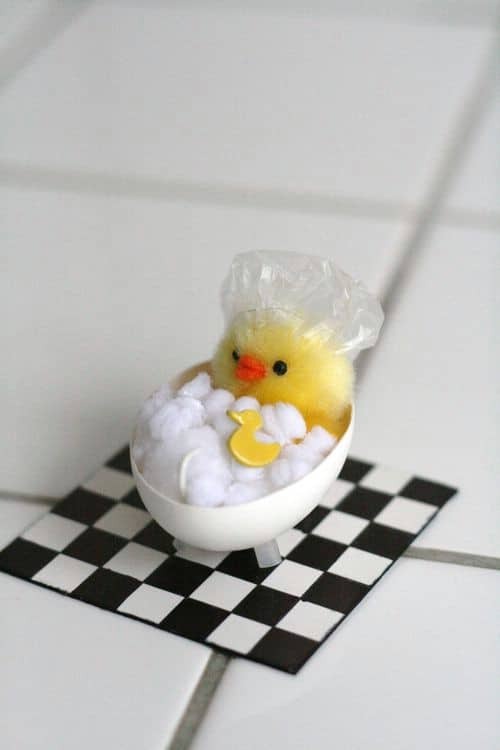 Use them for decorations or if you are using hard boiled eggs, they are sure to get loads of attention at your egg hunt. Overlapping dots make these eggs very unique and they are very easy to create. You will need a few supplies that you may have to pick up at your local hardware or home improvement store. The process however, is really easy and very creative. 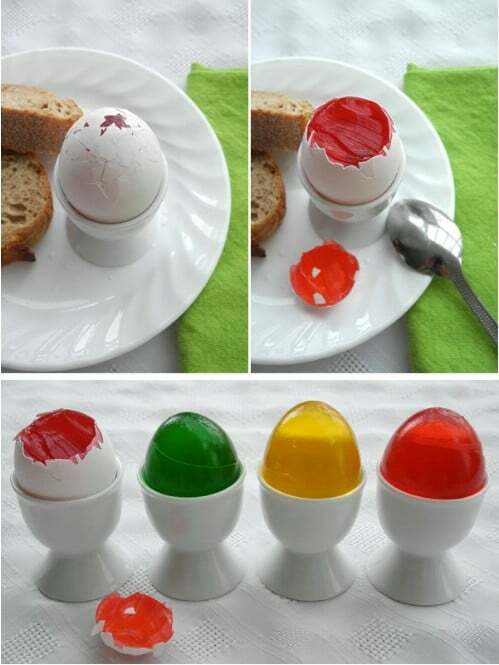 Food coloring makes the colors on the egg so they are perfectly safe to eat. These are great for older children or you could allow younger ones to help provided you do the cutting for them. 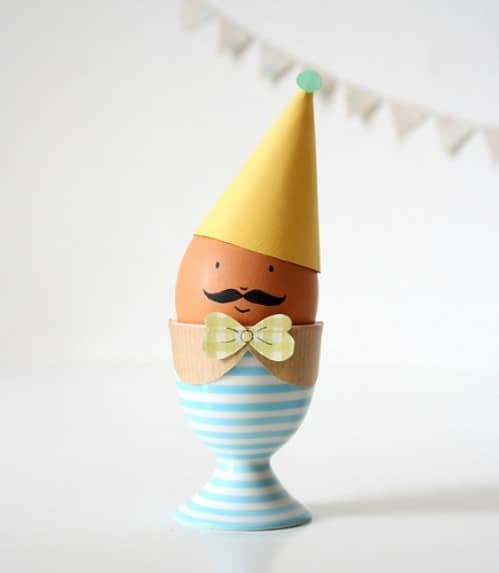 These little Easter egg men are sure to please kids of all ages. You will need paper, scissors, glue and some paint or markers along with masking tape to create them. 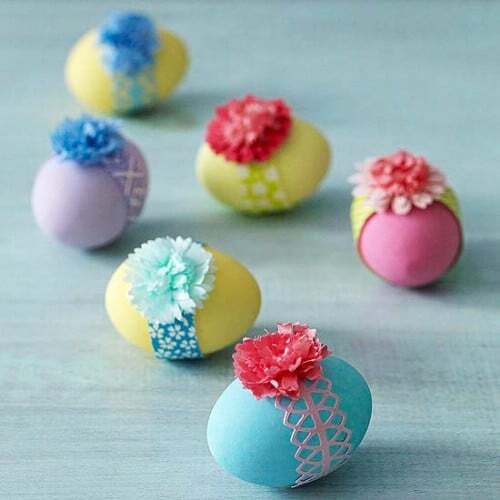 Note that while these may not be perfect for egg hunts (with the hats on anyway), they are great for Easter breakfast or for general decoration during the holiday. If you are planning a brunch for Easter, these are simply a must. Not all eggs are meant for egg hunts, but you could use these for that purpose if you want. 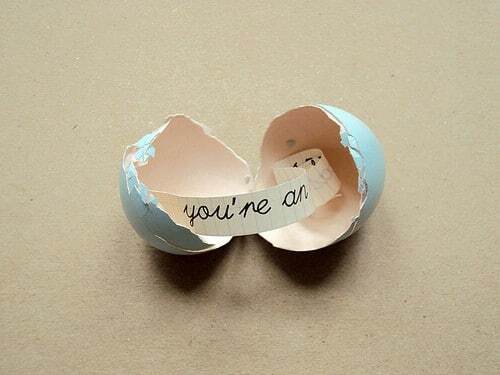 These little eggs are created to hold messages. You will have to blow out the egg from the shell, decorate and then you just insert a message on a piece of rolled up paper. These would make wonderful prize eggs for your hunt. You could just roll up a dollar bill and stick it inside or put in whatever message you want. Not only will these neon glitter eggs be beautiful on the lawn, they will be much easier to find for younger children than traditional pastels. You can make them in a host of different colors and really have a pastel colored egg hunt or stick with your favorite colors if you want. They are easy to do and this is a really good project for school aged children. 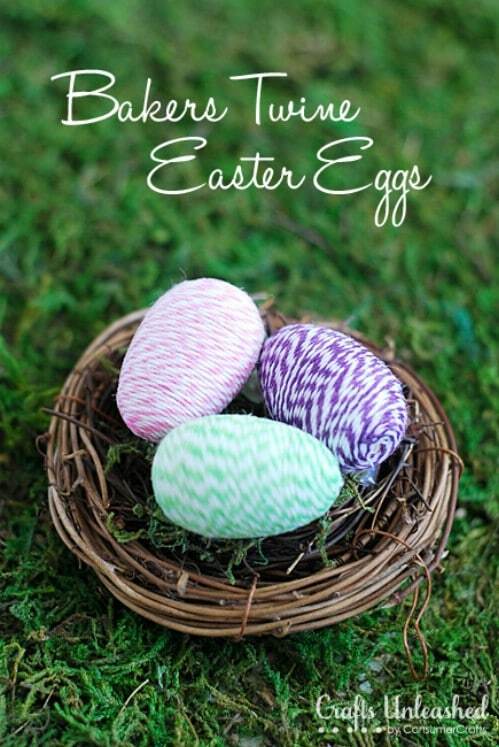 These twine covered Easter eggs are perfect for decorating or you could use them as prize eggs for an egg hunt. The gist of the project is to cover wooden eggs (although you could use real hard boiled eggs if you want) with baker’s twine in different colors. You can create beautifully multi-colored eggs or do several in solid colors. These are great if you want to host an egg hunt but really don’t want a lot of hard boiled eggs to deal with afterwards. Instead of simply coloring those eggs and leaving them out, why not build adorable sculptures with them? 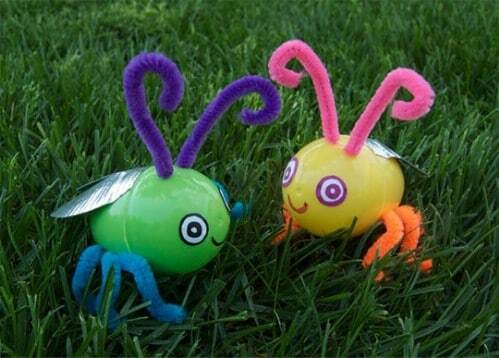 While this is probably not something that you want to do for lying in the grass at an egg hunt, it is a great idea for what you can do with all those hard boiled eggs after the hunt. The sculptures are really cute and you can decorate them however you like. Plain colored eggs are a thing of the past. Now, Easter eggs can have different patterns and you can even make lines and letters on them. Creating your own unique eggs is really not hard and it makes those egg hunts so much more exciting and even a bit harder depending on the colors that you use. 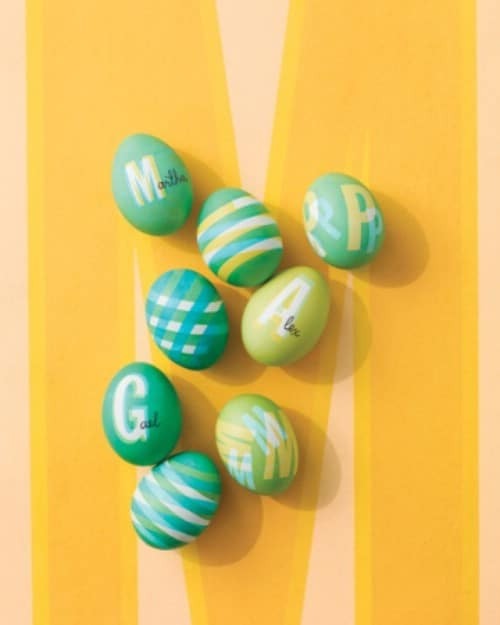 You can even spell out messages with your eggs when you add letters to them. If you love Mod Podge – and let’s face it, everyone does, then these eggs are sure to give you a thrill. They are colorful, glittery and really beautiful. 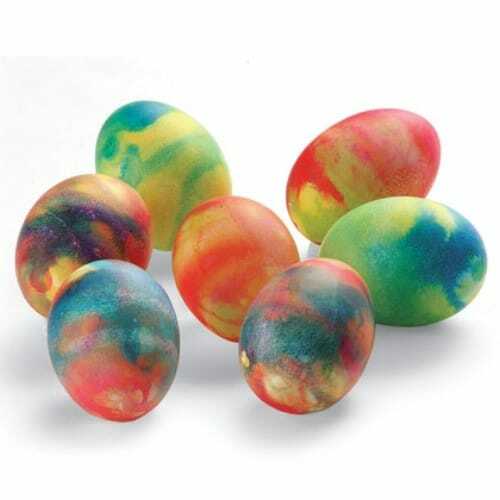 These work best with paper mache or wooden eggs so if you want to do away with tons of real hard boiled eggs, these are great for egg hunts. Kids will get to keep their eggs forever as opposed to cracking and throwing them away. Plus, they are great for decorating. If you have the time and the creativity, why not turn your Easter eggs into an art? There are so many ways that you can color those eggs without simply dyeing them. 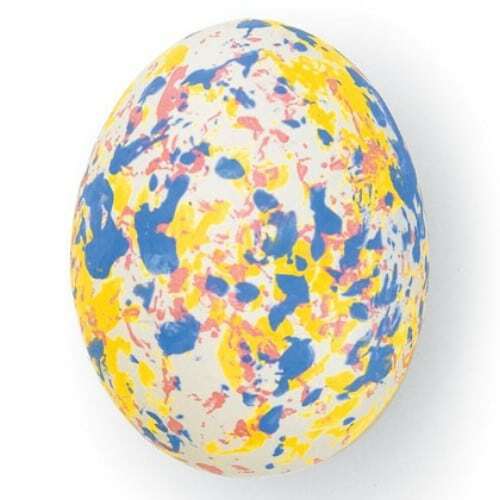 Incidentally, Easter egg coloring has been a tradition for centuries and dates back to times when art was really the focal point as opposed to vinegar and dyes. Consider showing off your creative talents this Easter and create artwork from those eggs. Even if you do choose to dye your Easter eggs in the traditional fashion, there are a number of ways that you can still make them unique. If you are an avid crafter, you probably have loads of craft supplies on hand. 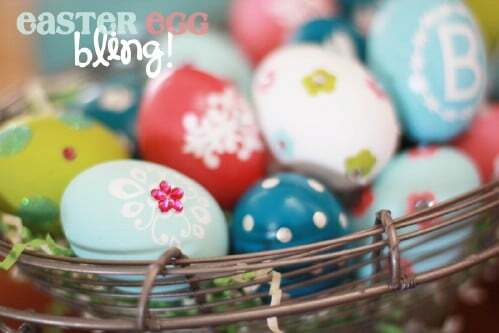 You can use those supplies to create beautiful bright and colorful eggs and give the kids something really fun to hunt. There really is no limit to what you can do once you let your creative juices flow. Glitter is a great way to make your Easter eggs really stand out. If you don’t really want to cover the entire egg with glitter, consider using stickers and making them glittery. You can probably find glitter stickers at your favorite craft store and if not, you can create your own. They are easy to do and this is a great project for kids of all ages. Shiny eggs are going to be so much easier for younger children to find on those egg hunts. Plus, these metallic eggs are beautiful and very unique. 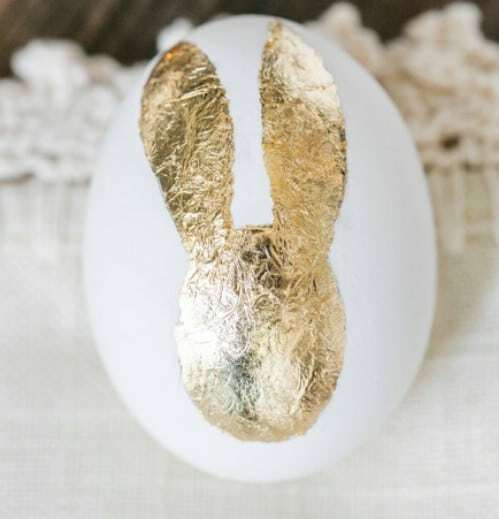 Note that it is recommended that you blow out the eggs prior to painting them with metallic paint so this may not be a project for those hard boiled varieties. 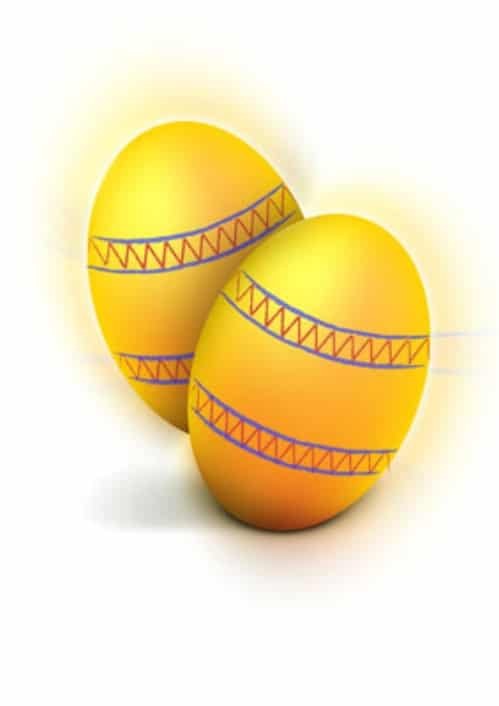 They do make wonderful decorations however and you can still use them in egg hunts – they just won’t be hard boiled. What child would not love to find zoo animals when they hunt for eggs? 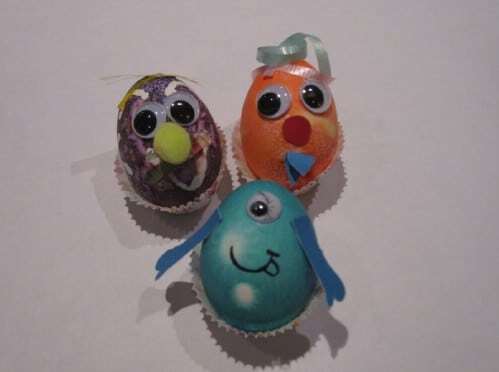 These little zoology eggs are so easy to make and this is a great project for the little ones. You will need to decide which animals are going to grace your Easter table and then choose dyes that will match the animal tones. These are so cute, so easy to make and are sure to thrill kids of all ages. Tie-dyeing is an art that has been popular for decades. Remember those cool t-shirts with loads of color? Tie-dyeing eggs is really easy and produces the same effect. You can use any combination of colors that you want to create the psychedelic effect and while it takes a bit longer than traditional dyeing, it gives you much more colorful and unique eggs in the end. Remember those mosaic pictures made from beans and rice? 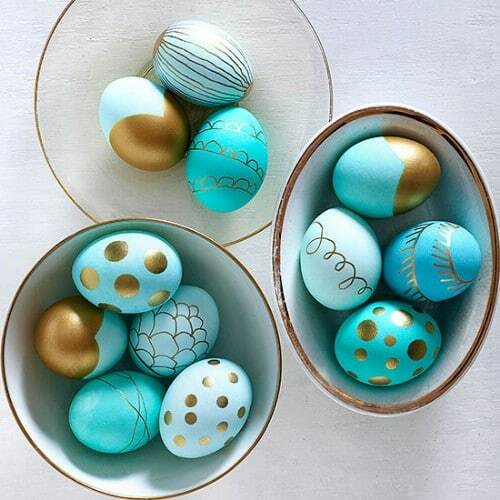 You can actually do the same thing with your Easter eggs and give them a wonderfully unique look. You will just have to decide on the specific pattern that you want to make or you can freehand it and really make them different. Mosaics are lovely to look at and this process is much easier to do than it looks. Instead of using store bought dyes for those eggs, you can use old silk ties, boxers or blouses that you aren’t going to want to wear again. You can even make the eggs really shiny by adding a little oil after they have finished dyeing. This is a great way to create unique eggs and save yourself a little money if you have silk fabric that you don’t really need instead of purchasing store bought colors. 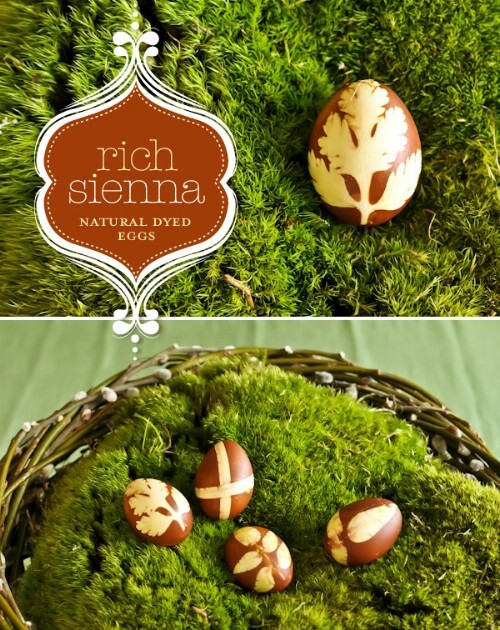 Use what you have around you to create beautiful natural Easter eggs. 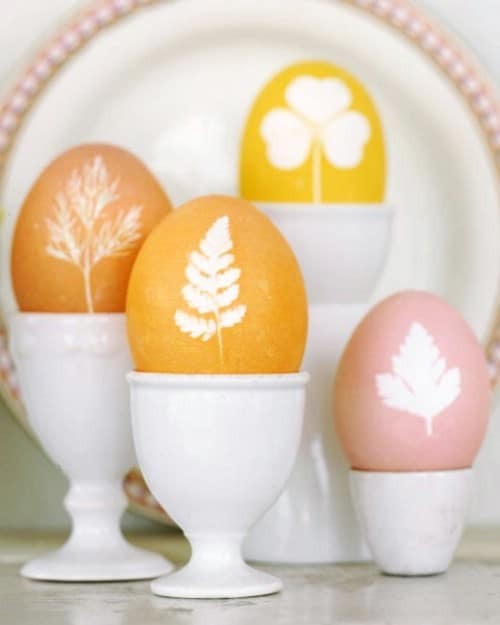 Small flowers, herbs or just about any outside growth can be used to decorate those eggs and you can avoid using dyes altogether if you want. 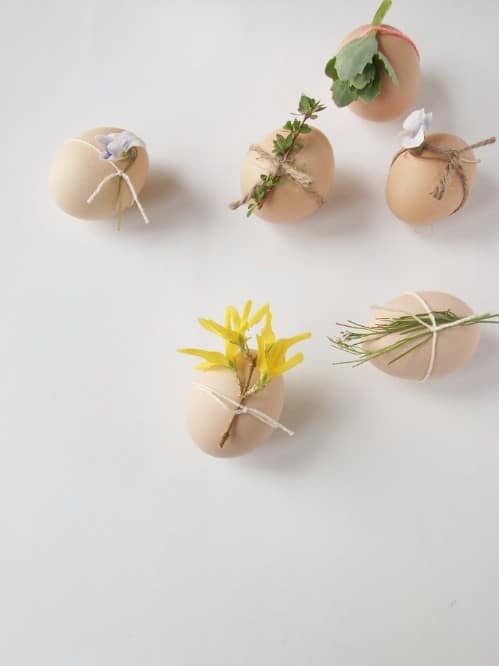 Depending on where you live, you may have loads of buds and small flowers coming up that could be used to give your eggs a natural look and one that is completely safe, without toxins. 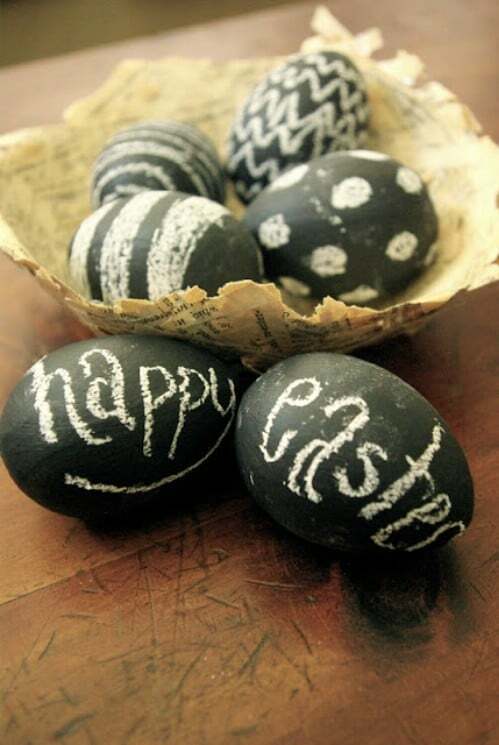 A little chalkboard paint and some creativity will give you lovely chalkboard eggs that you can use to display any message you want. While you may not want to use paint on actual hard boiled eggs that you plan to eat later, this works great with paper mache or wooden eggs or you could blow out the inside of the eggs prior to painting. This is another great idea for those who want a lot of eggs for an egg hunt but don’t really want to deal with a lot of leftover eggs afterwards. If you want to dye those eggs but you really don’t want to use store bought dyes or anything that may contain toxins, you can create your own natural dyes from many items that you probably have on hand already. The basis is pretty much the same but you will substitute natural products for dye tablets. You can create many different colors depending on the natural products that you use and make your eggs beautiful and safe. Have a Star Wars fan in your home? Let them help you to create wonderful little Star Wars characters for the egg hunt. You can do the traditional Star Wars characters or the Star Wars Lego characters. 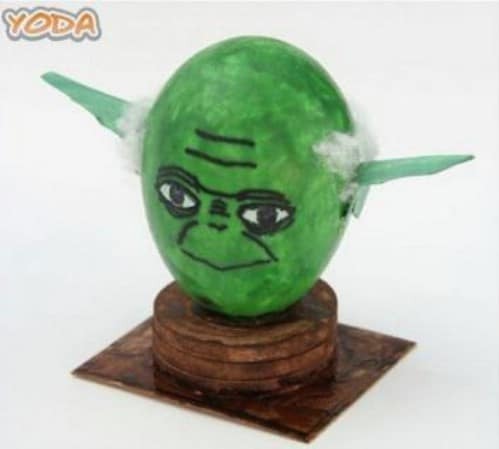 Add a few embellishments and you can make the eggs 3D which is sure to be a huge hit with any Star Wars fan in your midst. 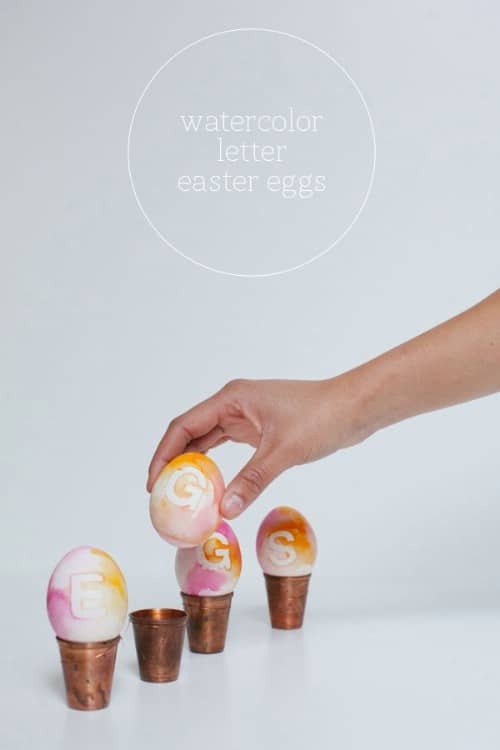 Watercolors can be used to create beautiful Easter eggs and you can make letters on them to make them a bit more personal. Kids can spell out their names or you could create your own little Easter message. 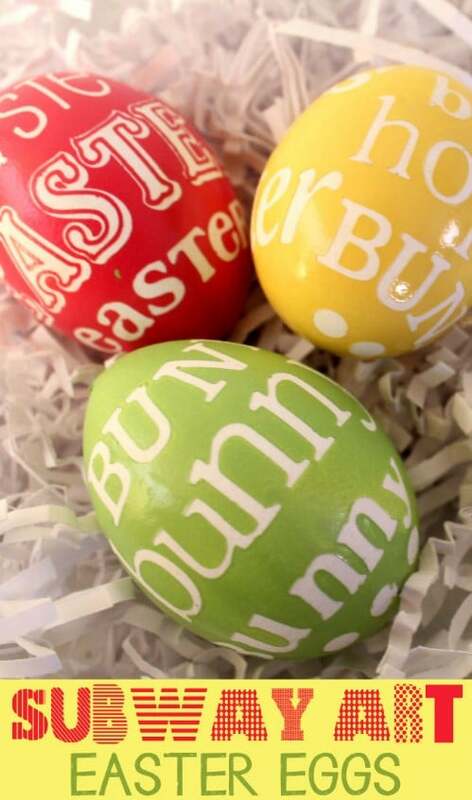 These are great for dinner place settings or simply write out small messages on them for little Easter egg hunters. While not really a decorating tip, these little Jell-O filled eggs are sure to please and they will be really colorful when you crack them open. If you don’t really want to have a refrigerator filled with hard boiled eggs after your hunt, blow out the eggs and fill some of them with Jell-O before you decorate. Kids will absolutely love cracking open their eggs and finding yummy Jell-O inside. Who doesn’t love Jell-O? 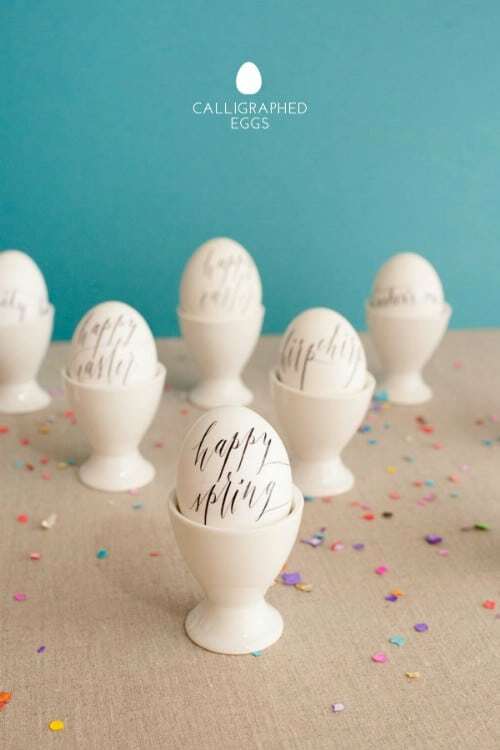 If you want something elegant and different, consider adding calligraphy to your Easter eggs. You can do this without dyeing if you want or make them really colorful and write on them after you have dyed them. You can create messages, write the names of your children or even deem an egg or two a prize egg by writing it in calligraphy. These are also great for place settings if you are planning an Easter brunch. 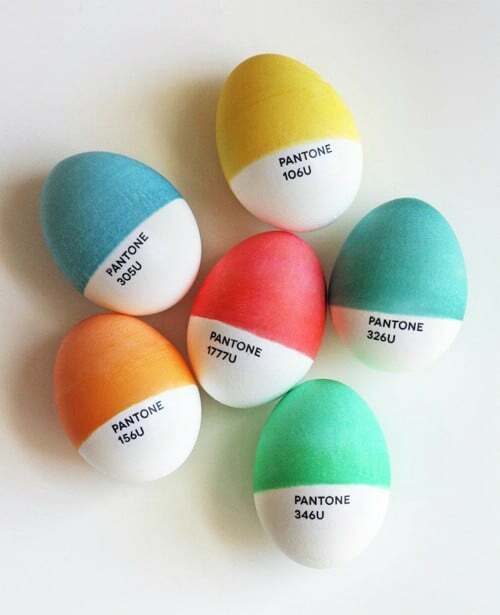 If you have a graphic designer in your midst, these Pantone Easter eggs are a great addition to your egg hunt. You just have to print off the writing or you could use temporary tattoos if you can find them in enough lettering to do the job. The dyeing can be done with traditional store bought dyes or you could use natural dyes that you can make yourself at home. 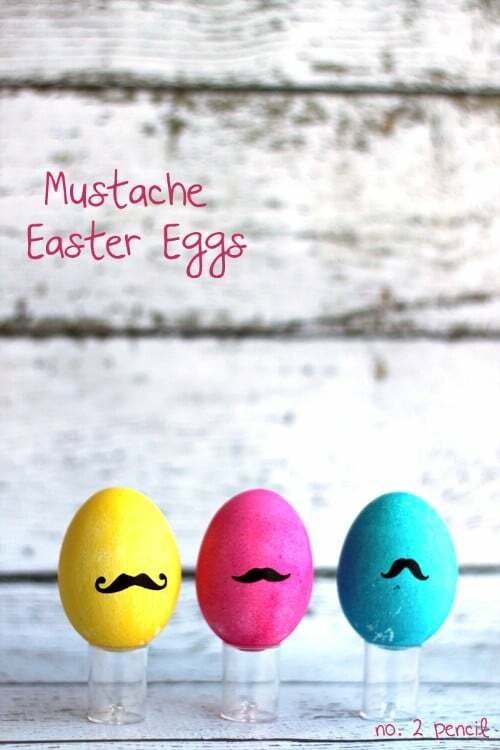 If your kids are into the mustache craze, why not carry that craze over to your Easter eggs? You can find mustache stickers or just draw them on yourself. This works well with or without dyeing so the process will depend on whether you want them plain or in bright, vibrant colors. You could also add other elements if you wanted to create an entire face. These eggs would be perfect for brunch if you are planning one. You can actually have the face of each person delegating your seating arrangement. Kids are sure to love hunting eggs that have pictures of their family and friends on them or you could use any photos that you wanted. If you don’t have a photo printer, you will need to order the prints that you want to use and make sure that they are small enough so they don’t overwhelm your eggs. Those googly eyes that you can purchase from craft stores are really cheap and you get tons in a package. 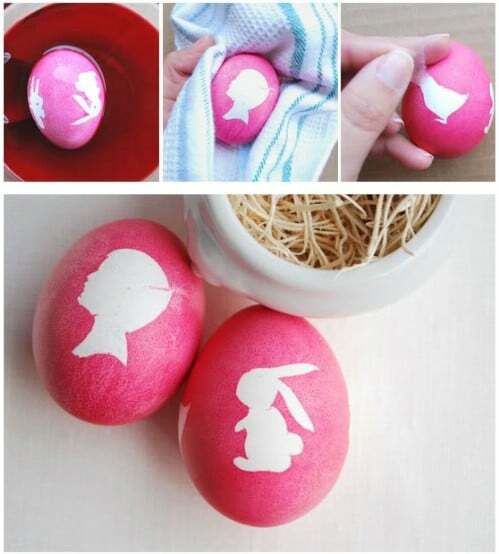 Why not put them to use when decorating your eggs this year? Your kids will adore putting eyes on their eggs and you can dye them or leave them plain. 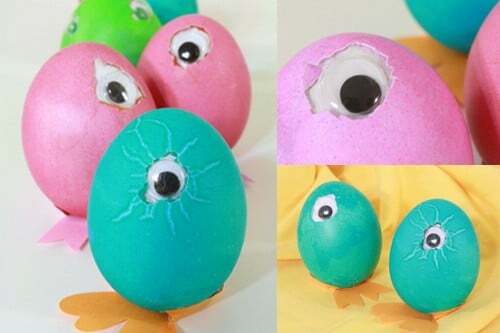 If you want to be really creative, add other facial features or just let the kids run wild with adding as many eyes as they can possibly get on each egg. 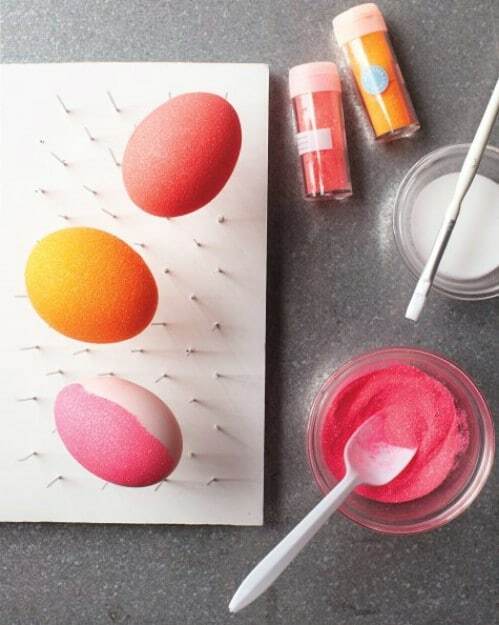 These eggs are beautiful and simple to do. You end up with an egg that looks as if it took hours to accomplish. Only you will know how fast and easy it was. You can do these in any color you want and use any pattern or image. You can use them as placeholders for your Easter brunch or even as decorations if you want to blow out the egg before decorating. 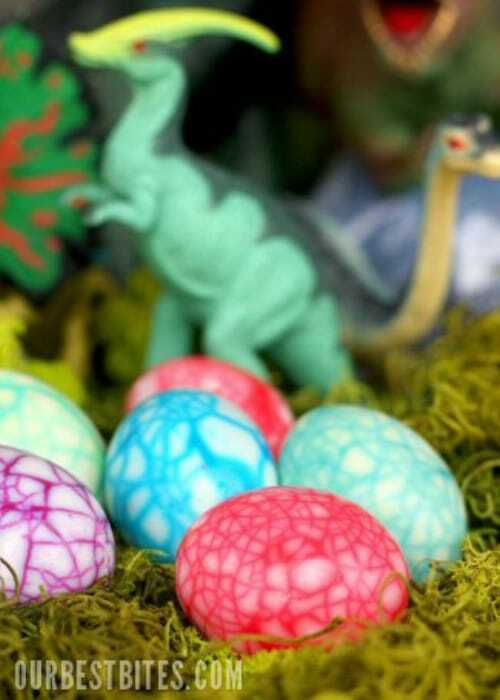 Younger kids are especially going to love these dinosaur Easter Eggs. They look like eggs that have cracked so that the baby dinosaurs can get out. They are very creative and actually easier to make than they look. Do them in multiple colors for different dinosaur types. The inside of the eggshell and the hardboiled egg will carry over the design so they are sure to thrill kids of all ages. 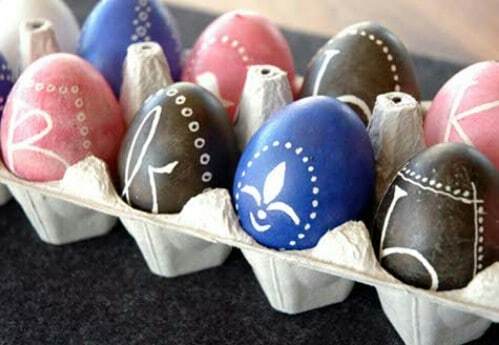 These Ukrainian designed Easter eggs are elegant and beautiful. If you are planning a brunch or you have adults who may want to participate in your egg hunt, these eggs are perfect. They use beeswax to make them look authentic and while it may take a bit longer to decorate them than traditional dyeing, they are definitely worth it. 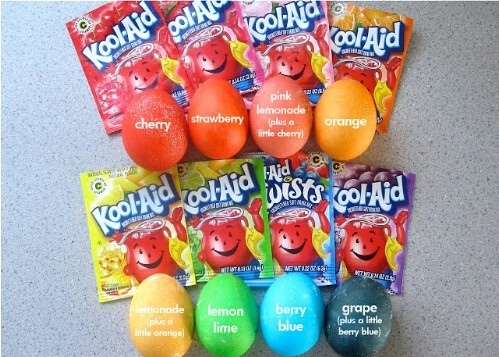 If you want to be certain that your Easter eggs are safe for the kids to eat, color them with Kool-Aid. This is a really simple method for dyeing eggs that the kids are sure to love. You will need to pick up several packages of Kool-Aid, depending on how colorful you want the eggs to be. Kool-Aid comes in so many different flavors and colors so you are sure to have an entire rainbow of Easter eggs when you are finished. 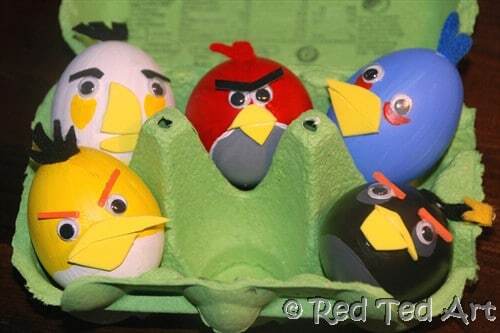 These Angry birds eggs are sure to please everyone in your home, particularly those who are hooked on this popular game. You can make one or all of the characters and it takes very little work. If you have older children who want to help you color those eggs, they are sure to enjoy this little project. 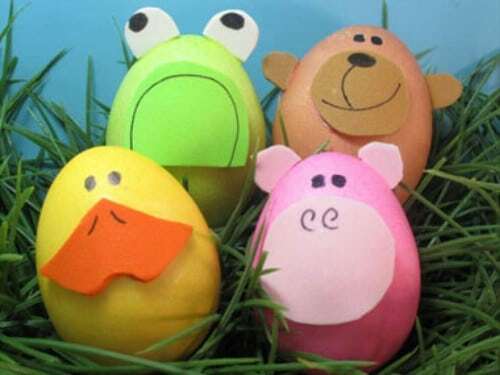 You can embellish the eggs with construction paper and other items to make them really stand out. 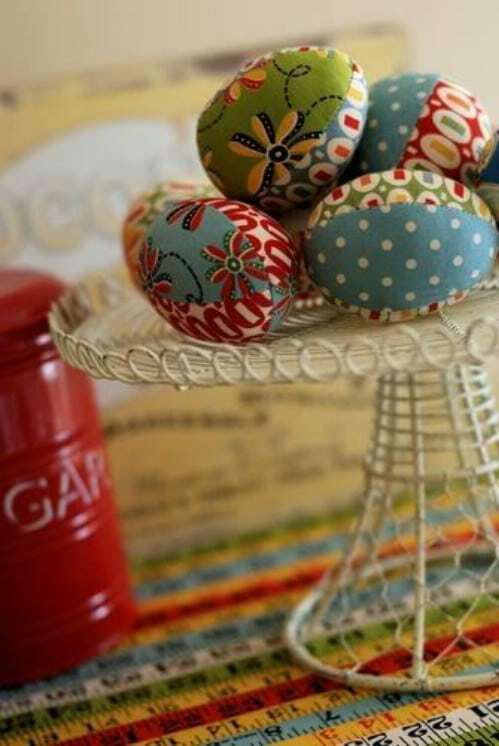 Make those eggs look retro and chic by covering them in scraps of fabric. This is a great project for those of you who have leftover sewing tidbits or small quilting squares. You can create beautiful eggs that are perfectly safe from dyes and toxins and the fabric will help to cushion the eggs just a bit so cracking while hiding or hunting is kept to a minimum. 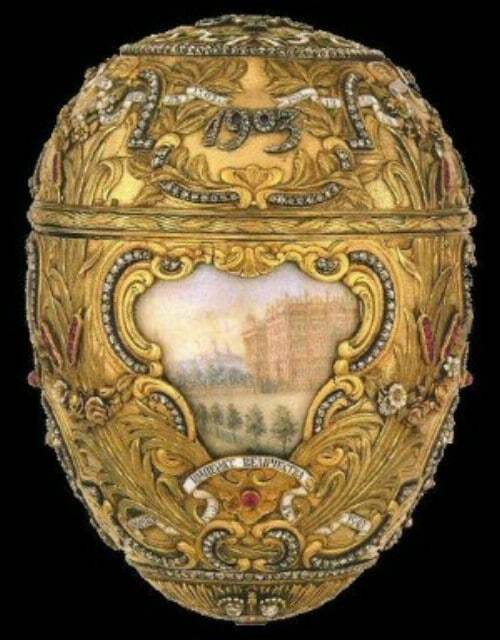 If you are planning to blow out the inside of the egg and you want a unique way to decorate the shell, why not embroider it? These are great for hunts (for those of you who really don’t want a lot of eggs leftover afterwards) or you could use them for decorating or place settings for dinner or brunch. What you embroider is entirely up to you. Note that you do have to use empty shells to do this. 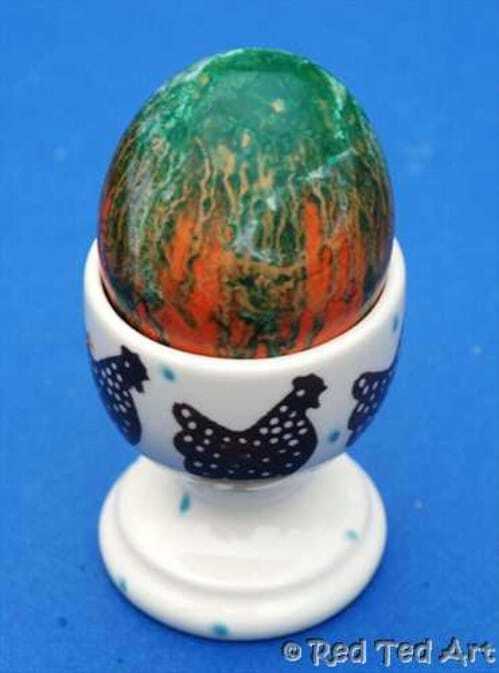 To create the marbled look inside a hardboiled egg, you need to be sure to use a dye method that is completely safe. You can create beautiful marbled eggs that are perfect for brunch by dipping them in a tea concoction to dye them. The eggs have to be cracked prior to dyeing so this may not be a great method for hiding eggs but it is perfect for the dinner table. For those of you who just love popping bubble wrap, wait until after you have decorated your eggs. Bubble wrap can give your eggs a really cool design and you can use it to decorate them before or after you have dyed them in your chosen method. After you have finished, you can pop that bubble wrap to your heart’s desire but this project works best with bubbles that are still inflated. Every mom has crayons in her house that she just can’t bring herself to throw away. If you have broken crayons that are missing their sleeves and you just don’t really know what to do with them, use them to color your eggs. 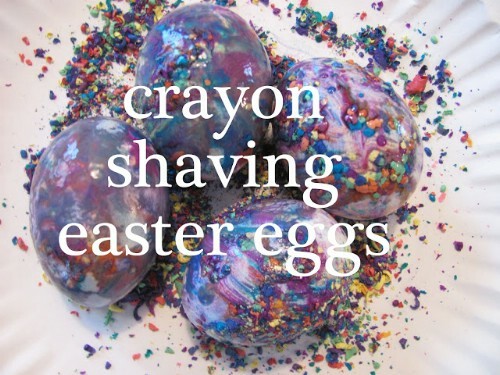 Crayon shaving Easter eggs are easy to do and great for kids. They can put as many shavings as they want and in any color combinations. The colors will meld together to create eggs that are all completely different from each other. 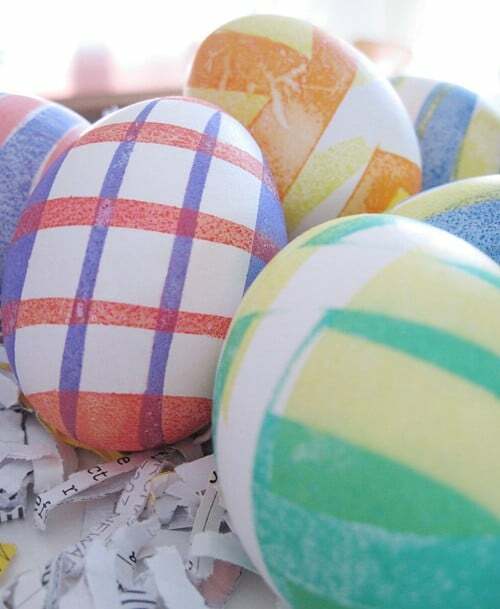 This method incorporates traditional dyes – or you could use natural dyes if you want – with rubber bands to create a very unique look for those eggs. You will need a few rubber bands, preferably in different widths to create unique looks for each egg. Choose whatever colors you want and use as many or as few rubber bands as you choose. These adorable fireflies will glow in the dark and are sure to thrill the kids. They are made with plastic eggs so no hardboiled varieties are needed. 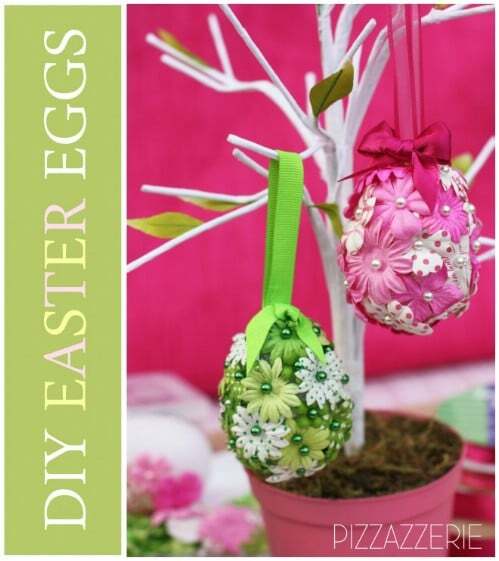 They are perfect for egg hunts that are going to happen later in the evening or for decorating the outside of your home for the Easter season. A tealight makes them glow and the color depends on the plastic eggs that you choose. These eggs will look like they just popped out of the volcano. The colors and hues resemble hot lava and this is a great project for toddlers and up. You can choose a number of different colors or make them all uniform if you wish. 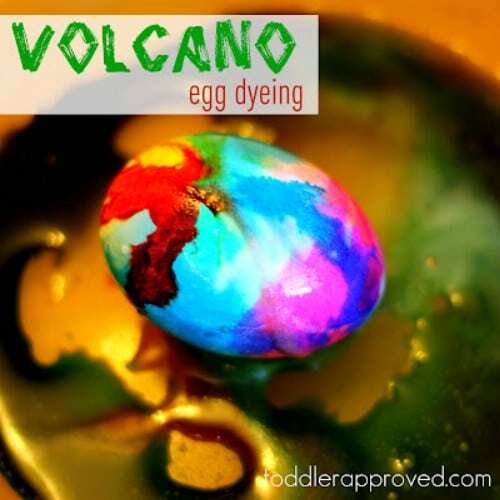 The best part is when the volcano actually erupts on the egg, which is why the kids are going to love creating these. A salad spinner is a great way to get a unique look for all of your Easter eggs and this is a project that is easy enough for even toddlers to do. Little ones will love experimenting with different colors and the best part is that by the time the salad spinner stops moving, your eggs will be nearly dry so you can hunt them right away or store them for later. To create unique patterns on your eggs you can use a number of different things. Hot glue works very well (this should be supervised by a parent for younger children). You simply put the glue on the egg and then dye it in your chosen method. The glue works much like crayons before coloring. It will resist the color in the spot that is glued and give you a wonderfully unique pattern. Crayons have been used to color and pattern Easter eggs for decades. A relatively new concept is to actually melt those crayons before you use them. You can combine different colors when you melt or do one color for each egg if you prefer. This is a great method for making unique eggs and one that helps you to use up those old bits of crayons instead of just throwing them away. 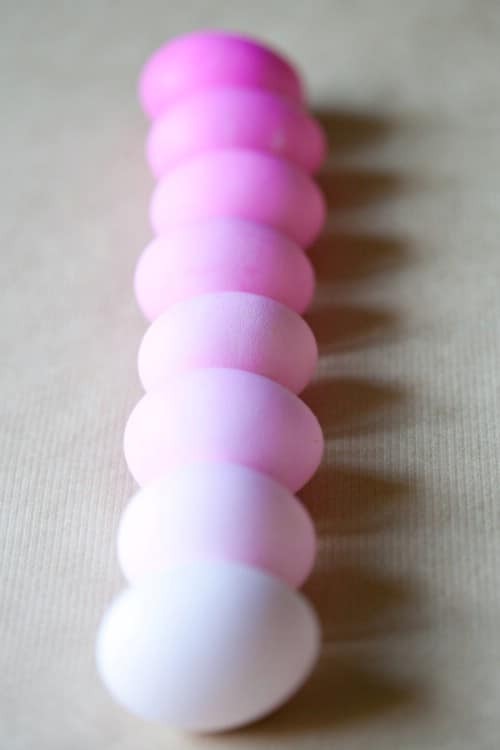 Wax drippings will help you to create unique and beautiful eggs that are sure to be a huge hit at your Easter party or egg hunt. If you have a few candles that have burned down to nearly nothing, use that colored wax instead of just throwing it away. This is a coloring method that won’t cost you anything but some leftover candle wax and is a great way for kids to express their creativity. 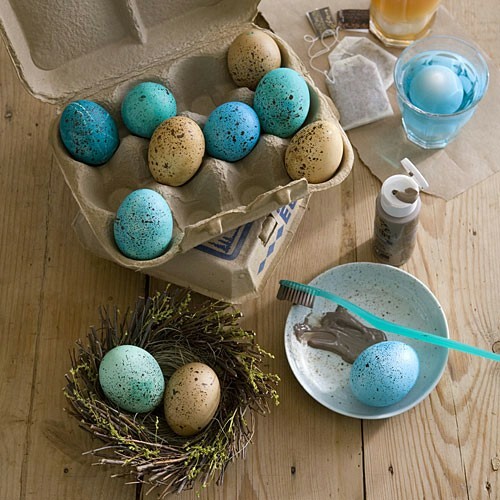 If you want your Easter eggs to look like real bird eggs, there are a few different methods that you can try. Speckled eggs will look just like robin eggs and are relatively easy to do. You can choose to do them in blue or brown to make them look authentic and even decorate them with other methods if you want to make them really unique. 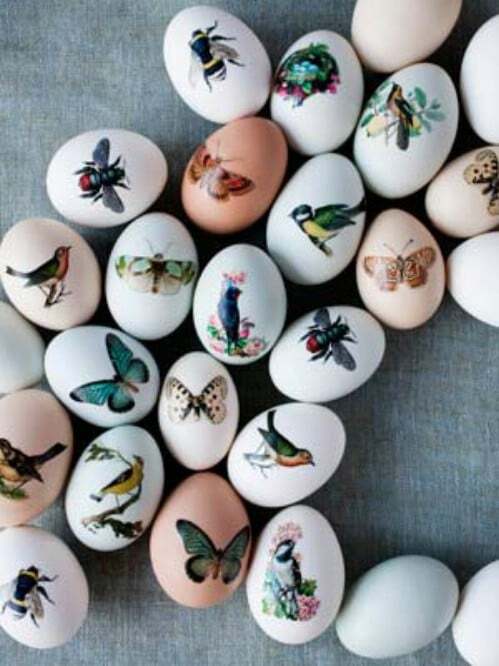 Temporary tattoos in various designs will help you to create exquisite eggs that will be perfect for any egg hunt. You can also use these to decorate your Easter brunch or dinner table. You can download and print the tattoos, choosing themes like butterflies or other botanical creatures and create beautiful eggs that are sure to please kids and adults alike. With some aluminum foil, you can create colorful and bold Easter eggs that are very reminiscent of the 80’s. The designs are very easy to create and are so colorful that they are great for hiding for the little ones. Your kids are sure to be able to pick these out of the grass easily and they look great in a bowl adorning the Easter brunch or dinner table. You don’t really use the sleeves of light bulbs directly on the egg, but they do help you to create unique looks for your Easter eggs. You can use those sleeves to create lines that can easily be turned into trees, flower stalks or many other pictures. This process uses acrylic paints although you could experiment with food coloring if you prefer to go that route. Imagine your Easter eggs holding today’s headlines. 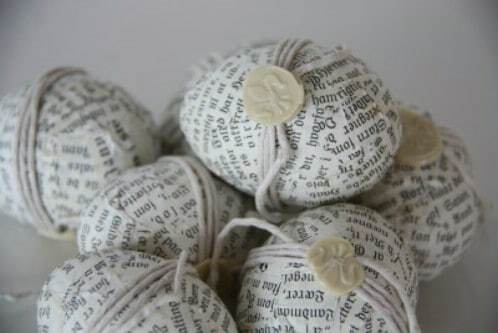 You can easily create eggs that are perfect for the journalist in you or just whimsical and unique. If you blow out your eggs beforehand, you can keep these for years and the news will remind you of when you created them. Note – if you do plan to blow out the eggs beforehand, be sure to keep the insides in a bowl in the fridge for scrambled eggs in the morning. send me some more photos pl of Easter eggs saw I can decorate them pl send them at 8:20 thanks .